Clint – we’re on a first-name basis – came on the country music scene in the late ‘80s with a breakthrough album called “Killin’ Time.” The album had a whole bunch of hit singles, including “A Better Man” and “Nobody’s Home.” (Nobody’s home, coincidentally, is exactly what a friend said happened to me whenever I played the album.) I was a bit of a music trivia nut then, and I was so impressed that Clint used his own road band to record the album instead of using a session band like everyone else did. 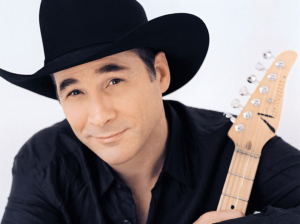 Getting Clint Black to Cody took a little doing, but the Stampede Board was clearly up to the task. The board worked with the Big Horn Radio Network to make it happen. The PRCA Xtreme Bulls event is scheduled for the night of June 30. It will be a great way to kick off the 100th anniversary of the Cody Stampede. 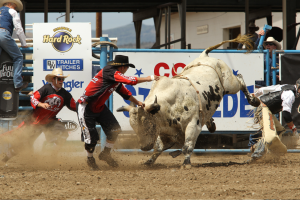 It’s been several years since the Cody Stampede included a major concert, so it will be a fitting way to mark the centennial of an event that was originally created to honor the legacy of town founder Buffalo Bill Cody. We’ll learn more details about the concert soon, and I’m hoping the board will also soon announce the Grand Marshal for the Cody Stampede Parade. We’re still waiting to find out who this year’s parade Grand Marshal will be. 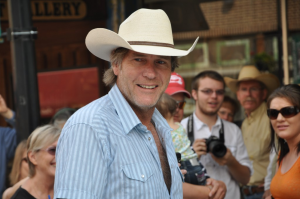 Robert Taylor, aka “Longmire,” is a past Grand Marshal. Until then, I’m Killin’ Time and loving life here in Cody Yellowstone.